This isn't a book that I'd like to review so much as I'd like just to feel, privately, and keep to myself. But it is precisely this type of book that cannot be kept to one's self. If I had the money, I'd buy everyone I know I copy of it. This book is an autobiography (co-written with R.S.B. Sawyer) of Zacharias' life and the beginning of his ministry, Ravi Zacharias International Ministries (RZIM). I became familiar with Zacharaias years ago when our local Christian radio station would play some of his sermons. I would always catch the tail end of the talks - certainly never more than a brief moment or two. Those few moments though were always packed with solid truths and I respected him and the message that he was bringing. He seemed well thought out. I really could not tell you very much about him before reading this book other than, "He seems like a real solid guy." In fact, I picked up this book because I was curious to know more. This book reveals a lot of him, a lot of his heart and a lot of his mission. Christian autobiographies and biographies are typically good sources of spiritual and inspirational material. You learn, very much so sometimes, that you really are not alone in this Christian walk. It is the people that you choose to read about that can shape and mold you. I think it is important (so much so that you should never try to avoid it!) to find heroes of the faith that you can look up to and follow after. My mother-in-law wrote down the following quote (that I do not know who to attribute to): "You will be the same person that you are now in five years except for the books that you read and the people you meet." So imagine reading books about real people who have suffered or succeeded and have solid advice to give!? It's a win-win situation. We were not meant to walk the Christian road alone and thankfully we neither have to, nor are we required to blaze new trails. At this "stage of the game", given the conveniences of this modern world and culture, we seldom have to pioneer new paths (with some exceptions but very few). However, we must learn how to respond individually to the situations and positions that God has placed us in. By reading about other Christians and their faith we are motivated to grow and pursue truth. The saints who have gone before (i.e., Jim Elliot, C.S. Lewis, etc.) can inspire and cheer us on as can the ones still living (and we can be grateful that they are so)! Ravi Zacharias is "worthy" of spending time learning about. He speaks to the present populace on matters relevant to us - yet with strength and determination to truth. Born in India, Zacharias spent his growing up years in a culture that was closed off to sharing personal experiences, emotions and feelings. It is amazing that he wrote an autobiography at all and is a great testimony in and of itself. He grew up in the East and offers explanations as to the mindset and traditions of people in India and the surrounding cultures. Every culture has its own positives and negatives and I thought he did a good job of presenting both for his homeland, as he did for Western culture. It is clear that he loves his place of birth. At the same time, he has spent the large majority of his adult life in the West. As this title suggests, he is explaining his transitions both in life and in culture in this journey God has called him to. As a Westerner, I appreciated hearing his reservations in sharing his life story. I'm not sure who this autobiography is written more for - the Western hemisphere or the East. Mr. Zacharias would have to say. His underlying message is certainly meant for both but this book was obviously driven by western curiosity. Zacharias gave me a powerful reminder that my life is not my own. I have been bought with a price. I can hand everything over to the Author of my life and know that He can be trusted with it. I am not alone. I am encouraged to remember that God is sovereign over all things. He does have an appointment with me. He is keeping it. The other night I had to walk across our yard of over grown grass to get to my in-law's house in order to take care of my sister-in-law's dog, which we had committed to watching in her absence. There was little to no light to see the small path through the yards. I brought along a lantern to help me find my way in the dark, and wished the whole time that I had remembered to go over and let the dog out before the sun had disappeared for the day. I held the lantern close down by my feet in order to see where I was stepping, making sure to avoid deer droppings and snakes. In the meantime, I was surrounded by mysterious rustlings in the tall grass and trying to ignore the shadows which the lantern was casting in every direction. I wasn't exactly comfortable in my surroundings. I started repeating the verse, "Thy Word is a lamp unto my feet and a light unto my path" and was reminded of an old sermon that a former pastor once gave to me in which he said God sometimes only gives enough light in order that we might take the next step. In other words, we aren't always given the opportunity to view the path as complete. We must obediently place one step in front of the other and acknowledge the Giver of Light to help us cross the dark terrain. One step. Baby steps. Obedience. The other lesson I learned on that dark walk was that if I held the light directly in front of me, I was not casting weird and distracting shadows onto my surroundings. I was easily distracted by the unknown if the light was pushed a little to my left or a little to my right. I needed to keep it fixated directly in front me so that I would not be misled. In life I find myself very distracted by the world, my personal responsibilities and commitments and, sometimes, my desire to have a good time. It is in those times that God's word, that lamp, is pushed to the side. Suddenly I'm overwhelmed by shadows. I lose sight of where my feet are supposed to be landing. I'm confused and then overwhelmed. It is not until I move the "lamp" back to the forefront that my mind and heart are at ease again. The night walk, combined with this book, encouraged me that God is still in control. Whether I'm focused or not - His hand is upon me. Ravi Zacharias is not here to preach himself. He is here to preach the Gospel. He himself was called out of darkness and into the light. God did that, as He has done in my own life, for which I am (and will be) eternally grateful. Again, I would encourage you to read this book and allow yourself to feel and be moved by his message. Let the reservations fall away and just listen to see what God might have you learn. It is, at the very least, certain that you have something to learn. You can learn more about Ravi Zacharias and his ministry here at RZIM. 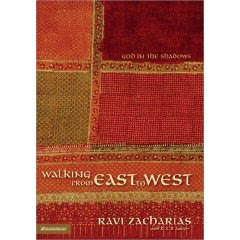 I have been thinking on whether to buy me a Ravi book-it would be my first.. and so I posted a question in google: Is the Ravi Zacharias book from East to West a good read? and, fortunately, I landed in your blog. So there. Im heading off to the bookstore-Ive been putting this off for days now.. I just read "Walking From East to West" and I would definately recommend it. Don't put it off any longer. I would also suggest going to oneplace.com and listening to his messages. I download it to my iPod and listen while I drive to work. My name is Newton Fernandez, and I have read or heard (audio books) several books by Dr Ravi Zacharias, yet I am most moved by his book titled, " Walking from East to West". Maybe it's because I understand and identify with the Indian culture being born in India myself. Or maybe it's because I have witnessed similar heart breaking moments growing up within my own family. This is not just a book to read, it's an experience of many such life lived whether in the East, West, North or South. Once you begin reading or listening to this book, I dare you to put it down unless for a real valid reason. Such pain and anguish can be felt and yet healed so well that even the scars do not show....God certainly heals us from "inside out". Buy this book and for the earnest reader, if you do not have money to buy this book and you are really hungry for HIS word, then write to me and I will do everything to get you a copy to read or listen to. re: The Jackal - thank you for your comment! It's actually been awhile since I've read this book and since I'd even read my post. But today you left your comment and I came back to re-read what I had said. There were a few things here that spoke to me all over again and stilled a voice inside of me that was complaining about the way certain things are these days. Need to put the light back in front of my feet so I can see where I'm going. So glad you found this post and commented, as it reminded me of some particular truths that were very enlightening (heh) in this 2011 moment!